January 2010 saw the re-launch of the Leonardo Electronic Almanac after a one year haitus. The online journal’s new format integrated features of a high-production-value art magazine with the scholarly rigor of an academic journal, combining invited and commissioned essays with peer-reviewed scholarly papers. 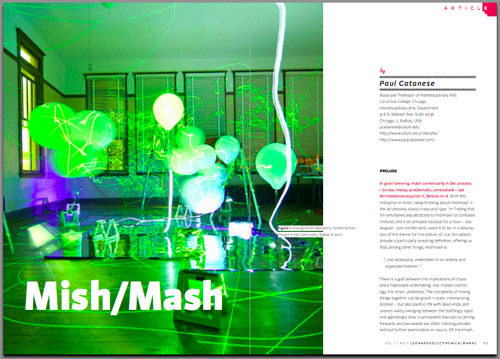 The launch issue’s theme, Mish-Mash, focused on the current convergence of arts, science and technology. Included among the contributions by important cultural operators was an article by InterArts faculty member Paul Catanese, whose article “Mish/Mash” dove head-on into the theme. While writing on the gulf between the implications of chaos and a haphazard undertaking, Catanese waded into the thorny issues surrounding interdisciplinary arts and cultural operators in the twenty-first century.